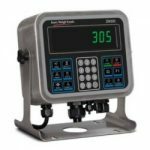 The UWE PSII (PS2) is a Stainless Steel, Washdown bench scale that is great for sanitary applications, as you can lightly spray it off without worry of damaging the scale. 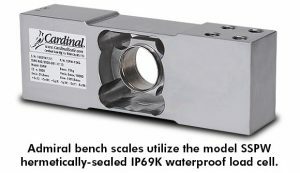 This scale comes with a stainless steel load cell as well, so rust and water damage is less of an issue over time. This is great for food production, and messy environments. 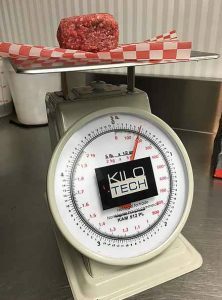 The manufacturer lists this scale as IP67 rated. FDA safety regulations on food production have compelled process equipment manufacturers to rethink their designs. 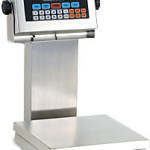 The UWE PS2 sets the pace for industry standards by producing a medium capacity food service bench scale that utilizes easy to clean stainless steel parts which wipe out the chances of food particles becoming trapped or hidden during washdown. The PS2 features all stainless steel platform, pillar, indicator, load cell and base. This means easy to clean for food processing or harsh environments / washdown resistant scale. The open pillar design allows for thorough washdown with less chance of food particles remaining. Heavy duty construction Will withstand harsh industrial operation and the sealed electronics leads to improved water and dust resistance. The low profile design is easy to load and unload with platform only 3.7 inches high. 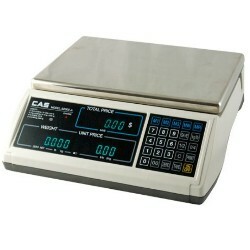 The scale displays weight in grams, pounds and pounds:ounces for flexibility of operation. 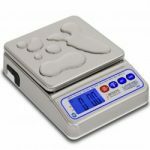 The UWE PS2 stainless steel scale is great for stationary applications or can easily be moved around with the built-in rechargeable battery or external power adapter. The battery lasts a minimum of 100 hours (without backlight). Automatic power save conserves battery power. And, Low battery indicator / charge status indicator alerts you to charge the battery, saving downtime. Accumulation function allows you to add together consecutive weights to arrive at a total. Adjustable stainless steel feet with rubber inserts help to make sure the scale remains level for accurate results on uneven working surfaces – anti-slip. The wide angle LCD display with backlight can be seen from a wide viewing angle. 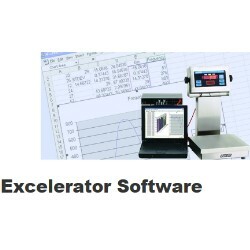 Gravitational correction software enables you to input different G acceleration factors. 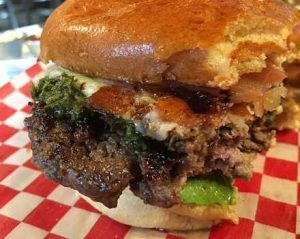 Food safety regulations have caused manufacturers to adjust or improve their designs over time. The UWE PS2 was recently redesigned and utilizes easy to clean stainless steel parts which wipe out the chances of food particles becoming trapped or hidden during wash down with water. 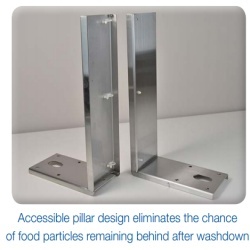 The easily accessible pillar design eliminates the chance of food particles remaining behind after washdown. Contact our sales department today for additional information regarding the UWE Scale lineup. You can call us at 919-776-7737 or complete our request for quote form on our website.